We already made a simple elasticated mask for this character which is ideal as a last minute Halloween craft because it's so quick and easy. 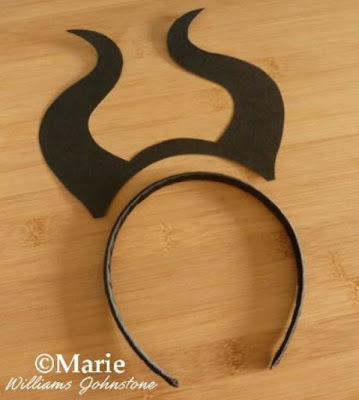 This tutorial is to make a Maleficent horned headband which takes a little longer to make but looks better. This looks especially good with long dark hair, because it is easy to slip on and off and the headband looks almost invisible. This means the curved horns stand out even more. See how to make this costume headband hair accessory with this step by step photo tutorial and get the free template to print off too. 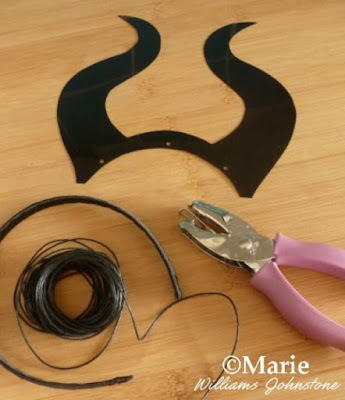 Enjoy this step by step photo tutorial on how to make a Maleficent horn headband with a free printable horns template to use. Step 1: Use the free printable horns template linked to above in the what you need section to print out the design onto a light colored piece of (preferably) card or paper. 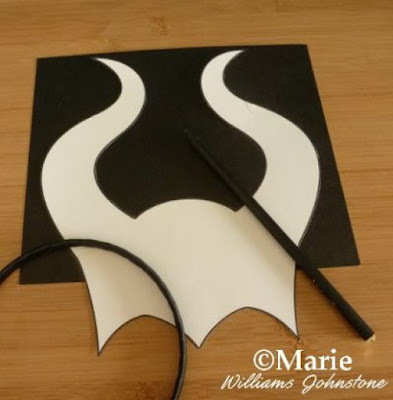 Cut this horns design out and then use this as a template to draw around onto a black piece of cardstock, craft foam or even plastic. 🎃 You may need to use a light color pencil like a white one or a chalk pencil to make your markings over the black. Alternatively you can tape your design down with a low tack sticky tape and cut around it. Be aware that you don't need the whole of this template design to make your headband. I've positioned the template on the paper here in the photo above roughly as you need to draw around it. You'll see why in the steps coming up. Step 2: Now place your headband at the bottom of the black card or foam and position it so that it becomes a nice guide for you to trace around and get your horns to fit your chosen headband perfectly. You want to leave an inch or so from the middle of the design to keep this nice and sturdy as you wear it. You can see the shape of this with the next photo for an idea of where to trace and cut. Step 3: This photo above makes it clear where you cut to make the correct shape to fit your chosen head band perfectly. 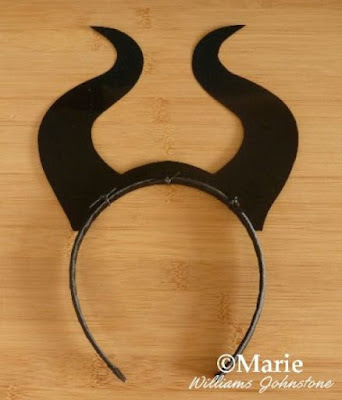 Step 4: There are a number of ways to attach the horns onto your headband. The simplest one is probably to use sticky tape on the back which wraps around the hair accessory and sticks to the back of the design. The issue with using sticky tape is that, although quick and easy, it can catch in the hair when worn and it can then pull apart easily. 🎃 Another option is for an adult to use a hot glue gun to draw a fine line of melted adhesive along the back rim of the design and then carefully stick the headband to it. This is a better option than tape and also fast to do. 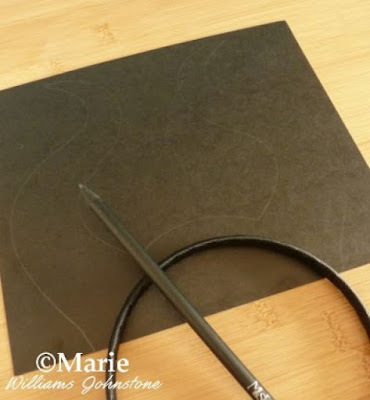 If you go for the hot glue gun method, you might need to color any glue that is showing when it is dry and hardened - you could use a black sharpie to do that. Alternatively, you can use black glue sticks. The method I'm showing you as another way is to use black cord and a hole punch. It's a bit fiddly but it looks and works better than tape and is a good, workable option if you have no access to a glue gun. Punch 3 holes along the bottom of the design as shown. Step 5: Tie the cord through each punched hole and around the head band, knotting to secure each one. You can use black elastic cord, a thin leather cord or twine to secure the horn design onto the hair accessory. 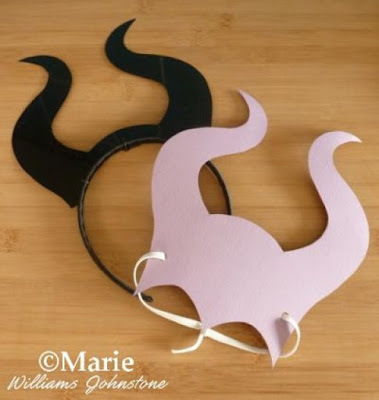 Step 6: This concludes my two different ways (other method below in related posts) to make easy paper based Maleficent horns either for kids dress up, for a party craft or for a Halloween costume. I hope you've enjoyed reading my justhalloweencrafts page today, thanks for your visit. Let me know what you think in the comments. Find my other Maleficent Horns Tutorial here on the Blog. Make up a Matching Rainbow Loom Bracelet. Why not Make a Pom Pom Witch Wand Too!